SPARKLING cultural celebrations shine on Purbeck in May and June with the 10th successive year of the Purbeck Art Weeks (PAW) Festival. The 2012 Festival galvanises a stellar line-up of regional and international artistic talent for 16 Festival days. Purbeck's creative showpiece takes place 26 May to the 10 June and spans the wider Royal Jubilee celebrations. The PAW Festival has grown substantially over the past decade. This year's event celebrates an impressive cultural programme, encompassing visual art, music, film and story-telling. Drawing on the success of previous years, a major part of the 2012 Festival is the active involvement of Purbeck's Young Artists. This involves 12 -schools across the region, helping Purbeck school-children develop artistic expression and exhibit their work at Rollington Barn from the 26 May onwards. The theme this year is the Carnival of the Animals, which encompasses the fabulous musical suite written by French romantic composer, Camille Saint-Saens. Purbeck is a timeless landscape of ever-changing colours. The region has attracted leading artists over the past 200-years drawn to the exceptional Jurassic Coast setting and unique light conditions available in the area. Artists range from distinguished landscape painter, Paul Nash to Toulouse Lautrec's contemporary, Charles Conder. Others captivated by Purbeck include Walter Field, Denis Lowson, Augustus John, Mark Gertler, Alfred Palmer, Graham Sutherland and Henry Tanworth Wells. Musicians included E.J. Moeran and Peter Warlock. • Author and TV/radio presenter, Melvyn Bragg, who gives a stirring talk about the cultural significance of the King James Bible. • Oscar winning composer Stephen Warbeck (Shakespeare in Love) and his group performing some of his famous music scores. • The world-renowned Gabrieli Consort & Players performing Handel's English Pastoral Acis & Galatea as well as a Handel oboe concerto. • The lyrical Brahms Horn Trio performed by international classical musicians Miranda Fulleylove, Fergus McWilliam and Huw Watkins. • Early Music Show presenter Lucie Skeaping joining fellow artists for a show on the theme of The Music of the Spheres. • The rising stars of the Sacconi Quartet for a programme featuring Mozart, Beethoven and Bartok. • Professional tuba players called 'YouTuba!' performing The Carnival of the Animals (the artistic theme for Purbeck Young Artists this year) and other works as well as opening the Festival in the grounds of Corfe Castle (26 May). • Illustrated talks covering talented Dorset artist and Director of the Glasgow School of Art, Fra Newbery. During the 16 Festival days, over 50 local artists will open their studios showing their recent work. Many of the pieces displayed are directly inspired by Purbeck's unique geology, flora and fauna. Artists will also talk about their work at the Festival's central exhibition space: Rollington Barn near Corfe Castle. During the 16 days, blue and yellow PAW Festival signs guide visitors and residents to working studios where painters, printmakers, sculptors, ceramicists, illustrators, jewellers, textile artists and photographers will be on hand to explain their work. There will also be the opportunity in some cases to participate in creative workshops. The Royal Jubilee will be honoured on Sunday 3rd June at the splendid Victorian Church, St James' Kingston, where international musicians, Mhairi Lawson (soprano) and Paula Chateauneuf (lutes), perform evocative music from the courts of Elizabeth I, James VI, Charles I, Charles II and William and Mary (including Dowland and Purcell compositions). During the opening Weekend at Corfe Castle (26 May), the spectacular venue provided courtesy of the National Trust; a dazzling procession of brass, drums, flags and masks, followed by circus acts, jazz and stallholders offering tasty local food and produce, will triumphantly open the Festival. For the following 16 days there will be the chance to 'Crown the Castle' by helping recreate a gigantic stone-built Jubilee Crown. A similar commemorative showpiece was also a feature of Queen Victoria's Jubilee - the picture attached shows how it looked then. The PAW 2012 Fringe offers an eclectic mix of established and emerging artists, fresh ideas, spontaneity and fun. It’s an opportunity to see exciting and entertaining work in an atmosphere that encourages taking a chance and discovering something new. Fringe events this year offer the chance to take part in a frockalicious bike ride to what is arguably the best pub in the world. Create a plasticine landscape inspired by the stunning Jurassic Coast. Help an environmental artist make patterns in the sand. Indulge in a bit of wild knitting. Photograph a Chococo dinosaur somewhere in the wilds of Purbeck. Listen to The Supernovas at The Legion. Enjoy Tapas while listening to Ansell & Gretel at Tawny’s Wine Bar. Equally, if you are mad about computers, please join in at the digital animation workshop. There's also the chance to find out why Shakespeare left his second best bed to his wife and hear Time & Tide telling tales on the Swanage sea front. Full Fringe information can be found at: http://fringe.purbeckartweeks.co.uk/ and on the PAW Facebook page. Tickets are now on sale for our next event, on Sunday 15th July at 7.30. Let the kids loose for some fun this half-term at Purbeck Sports Centre, Wareham. There seems to be a wish to discuss different aspects of business in Swanage, from the service of shops in the High Street, to the Mowlem, the Railway ...and so on. Here's the place for those discussions. Sea off Swanage a National Park? Visitors can now ride the Dorset Explorer number five service, which will run daily between 10am and 4.50pm. The service will run daily from 27th May (Sunday) to 30th September and is operated by Damory Coaches. Return ticket prices for adults will cost £2 and for children (7-18) £1.50. Concessionary pass holders and children under seven travel free. A ‘five for five pounds’ scheme will be on offer for groups to enjoy a return journey to the country park. If you want to raise a new topic, post your comment here — just click first on Comments below, then type in 'Post a comment' (top right of the next window). Can you choose a title for your post, please? Sometimes it's hard to work out what a comment is about and what the subject is. A new heading will soon be set up, allowing others to see and add their own comments. Not every topic will be posted (there's always the 'Chit-chat' topic for miscellaneous issues/observations), and please use an existing thread if possible. We try to keep posts civilized. And any posts that become too provocative, insulting, threatening or otherwise unpleasant will be deleted. People living in Purbeck are being offered the chance to have their say on how health services in their community are developed for the future. The local NHS and GPs have been reviewing how healthcare is provided in the area at the moment and have drawn up two sets of proposals. The aim is to make sure that services keep pace with best medical practice, are of a high quality and able to meet the future needs of local people. The proposals reflect the need to improve community services, enabling more people to be treated in or near their homes, avoiding hospital admission wherever possible. Dr Christian Verrinder, a Wool GP who is chairing the project alongside Dr David Haines a Swanage GP, said: ‘We would like to reassure people that these proposals are at an early stage and nothing will be decided until Purbeck residents have been given ample opportunity to let us know what they think. Between 24 May and 20 July 2012 residents, local organisations, local authorities, hard-to-reach groups and other interested parties will be asked for their views on current services and the new proposals. One way we will do this is through a series of workshops to which everyone is invited. They provide an opportunity to find out more, ask questions and give an opinion, so we would urge people to book a place. Then a final proposal will be drawn up, taking comments we have received into account, and local views sought in a variety of ways between September and November. How are health services delivered in Purbeck now? At the moment, there are: Six GP practices (at Wool, Sandford, Corfe Castle, Wareham, Swanage, and Bere Regis), Two community hospitals (at Swanage and Wareham). Between them they care for a population of around 33,000, providing a range of services for the people of Purbeck. At the moment, some services are provided in Swanage Hospital and Wareham Hospital. These old buildings are expensive to run and no longer used to the extent they once were, as new ways of caring for people in the community develop. Swanage Health Centre has outgrown its present site and is in urgent need of more space and facilities for the growing range of services GPs now provide. Generally, we feel it would be impossible to meet local and national clinical standards for healthcare needed for the future with the facilities available at the moment. The way healthcare is delivered is changing, with the emphasis moving to providing services close to - or in - people’s homes, avoiding the need for them to go into hospital wherever possible. If they do need to be admitted, community services working together can enable them to be discharged as soon as it is safe to do so. In Purbeck, we want to ensure that we use available resources in a way that means we can keep pace with these developments for our residents. For example, at the moment doctors, nurses and their teams are having to spread their work across the different sites, sometimes leading to duplication and inefficient use of their time. How can we improve this situation? The two hospitals are just 10 miles apart and are serving a relatively small population. Could we use the funding they need in a better way for Purbeck residents? These are just two of the questions we have been considering at a time when, in the current economic times nationally, everyone knows the importance of working in the best and most efficient way possible. However, we would stress that we are not cutting the health budget for Purbeck. Any savings we make through the changes will be reinvested in healthcare for the area. By doing this will be able to develop and sustain the high-quality services Purbeck needs and deserves. a GP practice a range of investigations, diagnostics and treatments including x ray and minor surgery under local anaesthetic a minor injuries unit outpatient appointments integrated teams working together to provide ‘hospital at home’ services potential to have some new services not currently available in the town. In Swanage the new building would include: a GP practice, a range of investigations, diagnostics and treatments, including x-ray and minor surgery under local anaesthetic endoscopy services, a minor injuries unit, outpatient appointments, potential to have some new services not currently available in the town, Inpatient care. The NHS would continue to provide inpatient care - including care for people at the end of their lives - by purchasing: six NHS-funded beds from care or residential homes in Swanage, eight NHS-funded beds from care or residential homes in Wareham. Some of these beds would be for palliative care and could be increased in number if needed. This proposes a brand-new Purbeck Community Hospital with up-to-date facilities based in Wareham and a modern, purpose-built polyclinic in Swanage. In Wareham the proposed new Purbeck Hospital would include: a GP practice, a range of investigations diagnostics, and treatments including x-ray and minor surgery under local anaesthetic, a minor injuries unit, outpatient appointments, integrated teams working together to provide ‘hospital at home’ services, 12 NHS-provided Community beds, potential to have some new services not currently available in the town. In Swanage the new building would include: a GP practice, a range of investigations, diagnostics and treatments, including x-ray and minor surgery, under local anaesthetic, endoscopy services, a minor injuries unit, outpatient appointments, potential to have some new services, not currently available in the town, Inpatient care. In Wareham, inpatient care would be provided in the new Purbeck Hospital (see above). In Swanage, the NHS would continue to provide inpatient care - including care for people at the end of their lives - by purchasing two NHS-funded beds from care or residential homes in the town. These beds would be for palliative care and general care and could be increased in number if needed. Phase 1: (24 May to 20 July 2012). Purbeck residents, local organisations, local authorities, hard-to-reach groups and other interested parties will be asked for their views on current services and the two new proposals. This phase will seek views in a variety of ways on the final proposal, which will have taken into account the comments we have received, information on how services are being used and best clinical practice. No final decision will be made about the proposals until these phases have been completed. 14 June 2012: 10.15am – 12 midday, Methodist Church, North Street, Wareham, 2.15pm – 4pm, Sandford Community Hall, Sandford, 6.15pm – 8pm, Bere Regis School, Rye Hill, Bere Regis. Places are limited, so please contact the NHS Dorset Involvement team on 01305 368064 to book a place. 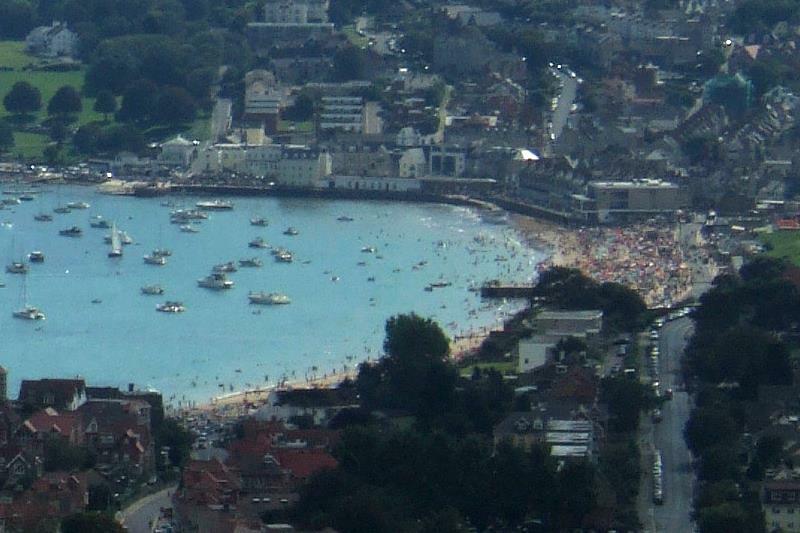 An additional workshop has been organised in Swanage to help local people share their views about proposals in Purbeck. Tuesday 26 June 2012, Methodist Church Hall, 105 High Street, Swanage, 6.45 pm for 7pm start. Places are limited, so anyone wishing to attend is asked to register in advance by calling 01305 368064 to book a place. Copies of the proposals along with an online response form can be found on the NHS Dorset website - http://www.dorset.nhs.uk/getinvolved/purbeck.htm. Swanage Senior Forum is privileged to have HEATHER BELL as our guest speaker on Wednesday 23rd May. She will give a fascinating presentation showing clips from her DVDs of two local projects covering the 2005/6 Swanage Beach makeover plus the exciting story of the Durlston Castle Restoration Project which takes us on a journey showing how it was brought back to its former glory. You may remember some of the grumblings against the idea of trying to improve our bit of coastline, and you only have to look and see what these improvements have meant for all of us today. Durlston Country Park, National Nature Reserve and Castle, is a jewel in the Jurassic crown of our area and age or infirmity should no longer be a barrier for any of us with the exciting new improvements that have been made to give easier access for all. Durlston is a fabulous 280 acre countryside paradise, including down land, hay meadows, fascinating wildlife and flowers. It boasts stunning views, accessible walking trails and the newly renovated Durlston Castle, where there is always something different to see and do. Or you can simply sit and have a cup of tea inside or outside on the terrace and admire the view. Come and hear and see Heather Bell and find out how it all came to pass – and be enthused to take advantage of the wonderful area in which we live. The Inspector has invited comments on the content of PDC's report by 4.00pm on 21st June 2012. It is stressed that there is no need to repeat any views that have already been expressed but any additional comments should be sent to the Programme Officer for forwarding to the Inspector. Comments should be no longer than 3000 words. Three paper copies plus a PDF/Word version are required. Please be aware that the comments will be published onto the EiP web site. “The Avengers” in only its third week on general release whilst nationally it is already highest grossing film this year. The certificate is 12A and we have it until Thursday 24th May 2012 (apart from Wednesday 23rd) at 7:30 p.m.. There is also a matinee at 2:30 p.m. On Monday 14th. Cinema seats are still only £5.50 Adult, £4.50 Concession and £4.00 Children. The recent films have been so successful that from 1st April to date we have taken more in film receipts than April. May, June and July together in 2011. On Wednesday 23rd May we have “Born in the Gardens” 7:30 p.m., tickets £10 and £9. Set in an ageing mock- Tudor house in Bristol in 1979, Maud and her stay- at- home son, Mo, pass their days happily together. He talks to the cat, plays his drums and concocts ridiculous cocktails for them both while she sits chatting away to the people on the telly. No amount of coaxing from Maud's suave elder son, Hedley, and Mo's glamorous twin sister, Queenie, will persuade the eccentric pair to lead a more normal life – even the “Michael wave” is a gadget too far and part of a world neither wishes to inhabit. This is a story set when new technology, business morality and social patterns were changing the nation's behaviour… master playwright, Peter Nichols, reveals in his hilarious and deeply touching play that change is not always for the best and that opening the cage door does not necessarily imply an escape. On Friday 25th May we have “The Cabinet Maker's Daughter” 7:30 p.m., tickets £11:00 and £9:50. 19th Century Fossil Hunter, Mary Anning, in the last days of her life and increasingly dependent on laudanum, battles to complete the presentation of one last fossil, that will rock the world. Into this frenzy bursts life-long friend, collector and artist Henry de la Beche. Henry’s arrival awakens emotions that Mary thought long buried. He has extraordinary news that Mary seems unable to grasp; together they embark on a strange journey back through her life, partly dream, partly memory revisiting amalgams of places, events, dinosaurs, and people long gone. Through it all is her enigmatic relationship with Henry; can Mary find resolution and peace? A play about frustration and achievement; dreams and memories - long, long ago. Just to let you know there is a Memeorial Ride for our old friend Rob Jefferies who was killed whilst out on his bike near Wareham this time last year. Its on Sunday 3rd June at 12.30 at the Sandbanks ferry. Then an easy ride to Swanage pier for light refreshments (tea, coffee, chip butty etc). Those that wish to can return to Sandbanks, while anyone who's up for a bit more can ride to the ghost bike on the Wareham bypass. The route is: Worth Matravers, Kingston, Corfe Castle, Arne, Stoborough and on to the A354.. Anyone is welcome to join . Purbeck District Council is putting out a final reminder to all Housing Register applicants who’ve not yet completed a new renewal form. In January, everyone on the Housing Register was asked to complete the new registration form in advance of the introduction of a new computerised system. Forms can be completed online atwww.dorsethomechoice.org. Applicants are advised to save the form regularly as it will 'time out' after approximately 30 minutes of inactivity. Alternatively, they can contact the Housing Needs Team on 01929 557370. After a soggy spring at last the sun was shining for some superb fishing at the third OK Classic Kayak Fishing Tournament which took place at Swanage on 12th May. Kayak anglers from all over the country came to take part in this competition which is organised by Johnson Outdoors UK and supported by AnglersAfloat. A record number of 19 different fish species were caught in this catch and release competition and over £1400 was raised for the local RNLI lifeboat station. A total of 133 competitors took to the water, including a growing number of junior anglers this year and the online fishing forums have been buzzing about what a superb tournament it was. “A fantastic weekend,” “a great success,” “a cracking day out once again,” – just some of the comments on AnglersAfloat. The winner was Keith Ward from Horsham who won an Ocean Kayak Trident Ultra 4.3. Second prize, an Ocean Kayak Prowler Elite 4.1 went to Ryan Turner from Lyme Regis and in third place was Ben Wallbridge from Wareham who went away with an Ocean Kayak Tetra 12 Angler. Because there were so many entries this year (the event now has over three times as many anglers taking part as it did when it started in 2010) the organizers even added another boat as a fourth prize. A Yak Sport was won by Amos Mak from Leyton. The top junior was Jamie Lloyd from Swansea who had some great fishing accessories to take home. Other great prizes included C-Tug kayak trolleys, a Pacific Action kayak sail system, paddles, buoyancy aids, a subscription to Sea Angler magazine, rod mounts, dry bags, kayak lights and various fun awards given away to competitors who distinguished themselves on the day. No-one went away entirely empty handed either as each entrant got a commemorative T-shirt plus an RNLI goody bag. Carolyn Hooper of Swanage Tourist Board presented the main prizes and Martin Steeden, Coxswain of the Swanage Lifeboat, accepted the donation cheque on behalf of the RNLI. The species caught were Undulate Ray, Small Eyed Ray, Mackerel, Bream, Plaice, Ballan Wrasse, Corkwing Wrasse, Pollack, Brill, Tompot Blenny, Garfish, Scorpion Fish, Gurnard, Shanny, Dogfish, Bass, Starry Smoothhound, Dragonet and Goldsinny. The current owners of the Sea Salt have yet again reduced the asking price for the cafe/bar & restaurant. In the event that someone does actually take it over, what type of business would you like to see running in these premises? High end restaurant, Asian all you can eat buffet, grill house, community bakery? And should the name be kept or changed? What ideas do you have? I wonder if there's a place for a thread to deal with things that may not be worth putting up as a 'New subject'? Here it is. If you want to raise a new topic, post your comment here — just click first on Comments below, then type in 'Post a comment' (top right of the next window). Can you choose a title for your post, please? Sometimes it's hard to work out what a comment is about and what the subject is. A new heading will soon be set up, allowing others to see and add their own comments. It seems it's sometimes easier to click on 'Post anonymously' than to open an account in your name - you can always add your name to your message. We try to keep posts civilized. And any posts that become too provocative, insulting, threatening or otherwise unpleasant will be deleted. All that is necessary for the triumph of evil is that good men do nothing." that's such a great quote. I think that local elections should only be for independant canditates that way one can assess the person rather than the party and know that they will act according to their own conscience rather on party lines. 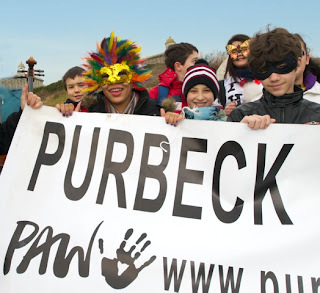 Keep Purbeck Special - show your support! Your support is needed at the Independent Examination into the Purbeck Core Strategy. The Hearings start on 8th May and will take place at Westport House. Please note that only those organisations and individuals already named may speak at the Examination but the hearings are open to the public and your presence will indicate to the Inspector the strength of local opinion. All the beaches in our area passed the water quality test. Kimmeridge only achieved the minimum standard. Would you recommend going for a swim in the sea and where is the best place to swim? Should the community clean the toilets and the streets and remove the graffitti from street signs in the weekend before the Jubilee holiday? Conservation Area does anyone care? 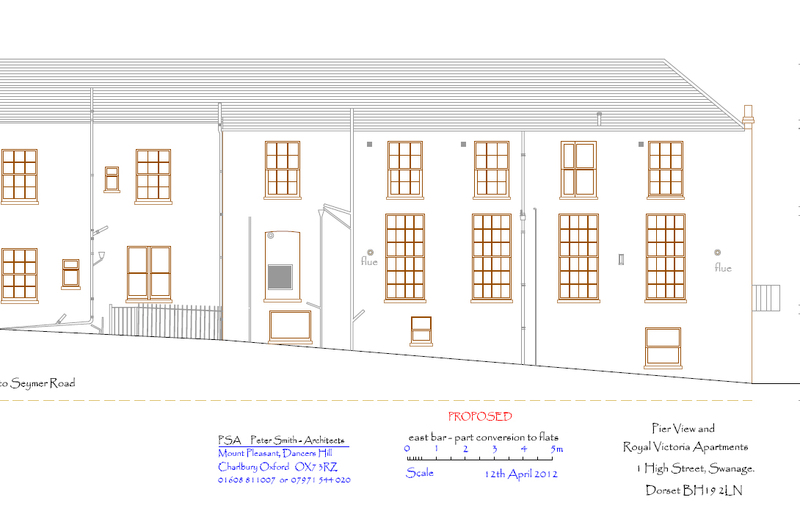 The East Bar has plans in to turn the first floor bar into flats. 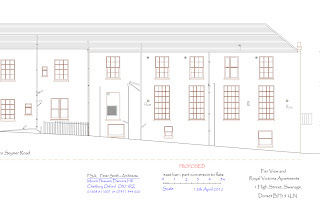 Would this be a good opportunity for the planners to insist on the reinstatement of the original windows including the boarded up one, and the replacement of the front balcony to match the west wing again? More than 300 Saxon and Viking re-enactment enthusiasts will be taking part in a vivid re-enactment of a bloody chapter from the history of Dorset at the castle over the bank holiday weekend. Weymouth-based Viking re-enactment group Hrafnslith (correct) will be bringing to life the 876AD siege of Wareham at the castle from Saturday May 5 to bank holiday Monday, May 7. The event is free, though normal castle admission prices apply. This year’s event features new elements including an expanded King’s court and the introduction of Cornish characters who join forces with the Saxons to repel the Viking invaders. “It will be an exciting day out with some hands-on activities for kids,” said organiser Tony Thorpe. The real siege of Wareham pitted King Alfred the Great against the Viking king Guthrum, whose men captured Saxon Wareham in a surprise attack. Corfe Castle stands in for the beleaguered stronghold as Alfred’s army attempts to re-capture the town.
" ...A Roe Deer was flushed out of its cover in Saxon field by a dog whose owner was not in sight. When gently asked to please keep it under control as there are also ground-nesting Skylarks in the southern half of the field the response was ‘he’s very friendly and doesn’t chase birds’ and ‘I understand about the Skylarks, my husband and I are environmentalists’ – followed by walking diagonally through the middle of the Skylark territories. If this is peoples idea of environmentalism this species long-term future looks grim." Why can' t people realise that the rules do apply to them - not just other people?